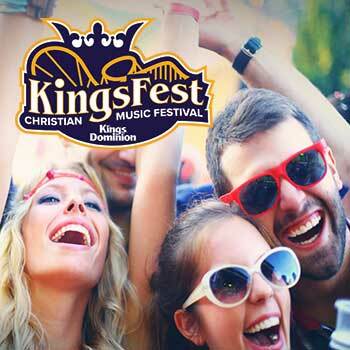 Thousands of contemporary Christian music fans from throughout the East Coast will descend upon Kings Dominion in June for the annual KingsFest festival. Set for Thursday, June 20 through Saturday, June 22, the three-day music festival will showcase national headlining artists from across the country at Kings Dominion's 7,500-seat, outdoor Kingswood Amphitheatre. Artists performing include TobyMac, John Crist, For King & Country, and more. Buy your park admission and concert tickets in advance! Tickets include park and concert admission (Season Pass discounted tickets do not include park admission). One-day, two-day and three-day tickets are available. If you purchased a Season Pass discounted ticket, you will be required to present and scan a valid 2019 Season Pass at the Front Gate turnstiles for park entry. VIP Platinum Packages include park admission, concert admission and one Meet & Greet (6/20 - TobyMac, 6/21 - John Crist, 6/22 - For King & Country). Please select Meet & Greet at time of purchase. Group rates are available by calling 804.876.5000 with groups of 15 or more receiving one free ticket. Group tickets are not available to purchase the day of the concerts at the door. KingsFest is a rain-or-shine event. *Price does not include applicable taxes and fees. The Box Office is open during scheduled park operating hours. The Box Office accepts Cash, Discover, Visa, Mastercard, American Express. Will call tickets may be picked up at the Kingswood Ticket Window near the main entrance. Customers must have the actual credit card, a picture ID, and the confirmation number. There is ample parking available with an additional fee. Kingswood Amphitheatre is accessible and tickets are available through the website and Box Office. For more information, please contact Kings Dominion at 804.876.5000. No smoking in the seating areas of the venue. No outside food/beverage to be brought in. No umbrellas in seating areas (shows are rain or shine-please bring a raincoat in the event of inclement weather). No cameras or recording devices. No weapons. Children age 3 and up are required to have a ticket. Age 2 and under admitted free when seated on an adults lap.